Daytona Beach International Airport Surveillance Radar. An airport surveillance radar (ASR) is a radar system used at airports to detect and display the presence and position of aircraft in the terminal area, the airspace around airports. It is the main air traffic control system for the airspace around airports. At large airports it typically controls traffic within a radius of 60 miles (96 km) of the airport below an elevation of 25,000 feet. The sophisticated systems at large airports consist of two different radar systems, the primary and secondary surveillance radar. The primary radar typically consists of a large rotating parabolic antenna dish that sweeps a vertical fan-shaped beam of microwaves around the airspace surrounding the airport. It detects the position and range of aircraft by microwaves reflected back to the antenna from the aircraft's surface. In the US the primary radar operates at a frequency of 2.7 - 2.9 GHz in the S band with a peak radiated power of 25 kW and an average power of 2.1 kW. The secondary surveillance radar consists of a second rotating antenna, often mounted on the primary antenna, which interrogates the transponders of aircraft, which transmits a radio signal back containing the aircraft's identification, barometric altitude, and an emergency status code, which is displayed on the radar screen next to the return from the primary radar. It operates at a frequency of 1.03 - 1.09 GHz in the L band with peak power of 160 - 1500 W.
The positions of the aircraft are displayed on a screen; at large airports on multiple screens in an operations room at the airport called in the US the Terminal Radar Approach Control (TRACON), monitored by air traffic controllers who direct the traffic by communicating with the aircraft pilots by radio. They are responsible for maintaining a safe and orderly flow of traffic and adequate aircraft separation to prevent midair collisions. 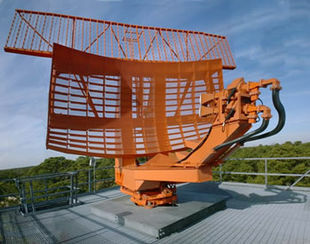 An ASR-9 airport surveillance radar antenna. The curving lower reflector is the primary radar, while the flat antenna on top is the secondary radar. These are older technology systems which will eventually be replaced. The final ASR-7 was located at Sawyer International Airport (formerly K. I. Sawyer Air Force Base) and was removed from service, being dismantled from atop the SAGE Building on January 22nd, 2019. It was replaced in 2018 with an ASR-8, which was mounted atop a free-standing tower located near the northwest end of the runway. There are approximately a dozen ASR-8s left in the USA with no scheduled replacement until at least 2025. The current generation of radar is the ASR-9, which was developed by Northrop/Grumman and first installed in 1989, with installation completing in 1995. Currently it is operating at 135 locations and is scheduled to continue in use until at least 2025. The ASR-9 was the first airport surveillance radar to detect weather and aircraft with the same beam and be able to display them on the same screen. It has a digital Moving Target Detection (MTD) processor which uses doppler radar and a clutter map giving advanced ability to eliminate ground and weather clutter and track targets. It is theoretically capable of tracking a maximum of 700 aircraft simultaneously. The klystron tube transmitter operates in the S-band between 2.5-2.9 GHz in circular polarization with a peak power of 1.3 MW and a pulse duration of 1 μs and pulse repetition frequency between 325 to 1200 pps. It can be switched to a second reserve frequency if interference is encountered on the primary frequency. The receiver has the sensitivity to detect a radar cross-section of 1 meter2 at 111 km, and a range resolution of 450 feet. The antenna covers an elevation of 40° from the horizon with two feedhorns which create two stacked overlapping vertical lobes 4° apart; the lower beam transmits the outgoing pulse and is used to detect distant targets near the horizon, while the upper receive-only beam detects closer higher elevation aircraft with less ground clutter. The antenna has a gain of 34 dB, beamwidth of 5° in elevation and 1.4° in azimuth. It rotates at a rate of 12.5 RPM so the airspace is scanned every 4.8 seconds. The electronics is dual-channel and fault tolerant. It has a remote monitoring and maintenance subsystem; if a fault occurs a built-in test detects and isolates the problem. Like all airport surveillance radars it has a backup diesel generator to continue operating during power outages. The Digital Airport Surveillance Radar (DASR) is the new generation of fully digital radar that is being developed to replace the current analog systems. The US Air Force Electronics Systems Center, the US Federal Aviation Administration, US Army and the US Navy procured DASR systems to upgrade existing radar facilities for US Department of Defense (DoD) and civilian airfields. The DASR system detects aircraft position and weather conditions in the vicinity of civilian and military airfields. The civilian nomenclature for this radar is ASR-11. The ASR-11 will replace most ASR-7 and some ASR-8. The military nomenclature for the radar is AN/GPN-30. The older radars, some up to 20 years old, are being replaced to improve reliability, provide additional weather data, reduce maintenance cost, improve performance, and provide digital data to new digital automation systems for presentation on air traffic control displays. The Iraqi Air Force has received the DASR system. ASR data is displayed on Automated Radar Terminal System (ARTS), Common Automated Radar Terminal System (CARTS), and Standard Terminal Automation Replacement System (STARS) display consoles in control towers and Terminal Radar Approach Control (TRACON) rooms, usually located at airports. CARTS will be replaced with STARS at all TRACONs during TAMR Phase 3 - Segment 1 as announced by the Federal Aviation Administration (FAA) in the Spring of 2011. All remaining ARTS (IIE) sites will be replaced with STARS during TAMR Phase 3 Segment 2 as announced by the FAA in the Spring of 2013. The Standard Terminal Automation Replacement System (STARS) is a joint Federal Aviation Administration (FAA) and Department of Defense (DoD) program to replace Automated Radar Terminal Systems (ARTS) and other capacity-constrained, older technology systems at 172 FAA and up to 199 DoD terminal radar approach control facilities and associated towers. STARS will be used by controllers, at facilities who already have it installed, to provide air traffic control (ATC) services to aircraft in terminal areas. Typical terminal area ATC services are defined as the area around airports where departing and arriving traffic are served. Functions include aircraft separation, weather advisories, and lower level control of air traffic. The system is designed to accommodate air traffic growth and the introduction of new automation functions which will improve the safety and efficiency of the US National Airspace System (NAS) as the legacy systems are replaced. Airport Surveillance Radar is beginning to be supplemented by ADS-B Automatic dependent surveillance-broadcast in the US and other parts of the world. As of Spring 2011, ADS-B is currently operational and in use at the Philadelphia, PA TRACON and Louisville, KY TRACON. ADS-B is a GPS based technology that allows aircraft to transmit their GPS determined position to display systems as often as once per second, as opposed to once every 4 seconds for a short range radar, or once every 13 seconds for a slower rotating long range radar. The FAA is mandating that ADS-B be fully operational and available to the NAS by the year 2020. This will make possible the decommissioning of older radars in order to increase safety and cut costs. As of 2011, there is no definitive list of radars that will be decommissioned as a result of ADS-B implementation. ^ a b "Airport Surveillance Radar". Technology. US Federal Aviation Administration (FAA) website. 2014. Retrieved April 23, 2017. ^ Advanced Radar Improves Iraqi Air Surveillance American Forces Press Service (Oct. 30, 2009). This page was last edited on 7 April 2019, at 07:38 (UTC).